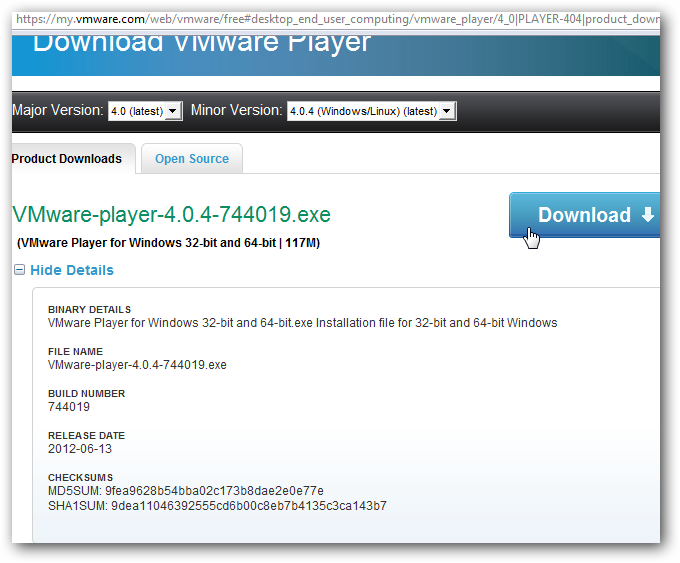 Run Any Operating System on Windows Using VMware Player Freeware. VMware Player is enough for any normal Windows user to use Virtualization and run any OS. VMware is well known for stable Virtualization softwares and VMware Player is far better in performance for Desktop PCs. Why VMware to Run Any Operating System ? Windows Virtual PC is free for Windows PC (at least for Windows 7 is needed) but VMware has numerous advantages over Windows Virtual PC – basically you can run Any Operating System with better graphics, faster performance and most importantly – VMware is The Standard for virtualization. Make sure that you have enough physical RAM, we recommend at least 4 GB for 64 bit version of Windows 7 , active cooling fans and most importantly the processor should support Virtualization natively. There are ways to run virtualization on non supported processors, but we will say to stay away to save your hardware. Basically its very easy to Run Any Operating System on Windows Using VMware Player. We are just pointing out the basics and you can practically use any Operating System to test or use it to run commands on Server, do other works. Install it, its an exe file. Basically you will need images of the Operating System. Most Operating has ready made image those can be used or you can use VMware vCenter Converter to convert any OS to .vmx files to run on your PC. Here is a free 14 paged pdf from VMware, you can download it for free, its enough detailed guide itself to run any Operating System on Windows Using VMware Player Freeware. We have not described as a full guide as they have official tuts for the beginners. This Article Has Been Shared 3800 Times! Virtualization Software for Mac OS X to Run Ubuntu 10.04 LTS is mainly targeted to run Bare Metal for OpenStack Private Cloud Software,but it will work for all. Virtualization is typically used to mean by processor virtualization. Besides the processor virtualization, there are other types like for disks or network. Multi-Core Processor Based Computer vs. Multi-CPU Computer has differences. For Servers, Workstations the processors are multiple plus multi-core on one board. Cite this article as: Abhishek Ghosh, "Run Any Operating System on Windows Using VMware Player Freeware," in The Customize Windows, August 8, 2012, April 26, 2019, https://thecustomizewindows.com/2012/08/run-any-operating-system-on-windows-using-vmware-player-freeware/.